With all the scary talk these days about head injuries in football, many are wondering where the sport goes from here. 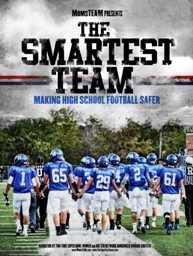 The answer is a new, hour-long documentary, "THE SMARTEST TEAM: Making High School Football Safer", currently airing on many PBS stations around the country through January 2014. THE SMARTEST TEAM is the brainchild of visionary youth sports safety and parenting expert and author, Brooke de Lench, and draws on knowledge she gained as a parent of a concussed high school football and lacrosse player and, for the past fourteen years, as publisher of MomsTEAM.com,® the acknowledged "pioneer" in youth sports concussion education. The SMARTEST TEAM starts where other concussion documentaries leave off. Instead of scaring football parents, the documentary shows how one high school football program in rural Oklahoma, working with a team of world-class concussion experts assembled by de Lench, increased concussion awareness among players, coaches, parents, and health care professionals, improved concussion identification and management, and, best of all, reduced their concussion rate by 75% in a single season. Retirement: Recommending retirement from when continued participation in football poses an unreasonable risk of permanent brain damage. Coach Bobby Hosea of the Train Em' Up Academy and developer of the Head Free Tackle System. "THE SMARTEST TEAM shows what can happen when all stakeholders work together to make the sport of football safer, not just for their own kids but for all kids," says de Lench. "More broadly, it charts a path forward, not just to preserve but to strengthen youth and high school football, which play such an important part in the life of so many communities across America." Now in its fourteenth year, MomsTeam.com® is the premier online youth sports parenting information gateway for America's 90 million sports parents. A content provider to the National Football League's health and safety website, NFL Evolution.com, MomsTEAM's Concussion Center is widely regarded as one of the most comprehensive and up-to-date resources for concussion information on the Internet.